We're always eager to promote what is going on liturgically at Catholic universities, and so it was with interest that we recently received the following press release from the College of St. Mary Magdalen in New Hampshire. We recently noted that this college had begun celebrating all their college Masses ad orientem this academic year, that they are celebrating both forms of the Roman liturgy, and are also offering their students access to the Divine Office -- as noted below. Now we hear that the college has also adopted the Simple English Propers -- which we feature here each Friday afternoon -- within the context of the modern Roman liturgy. As a general comment, it is very encouraging to this and other Catholic liberal arts colleges advancing Pope Benedict's new liturgical movement. We hope to hear more from these colleges in the near future. Beginning this year, students at the College of Saint Mary Magdalen (www.Magdalen.edu) are supporting the Holy Father’s renewal of the liturgy by singing the Propers of the Mass in newly composed English settings by Adam Bartlett. These settings appear in the Simple English Propers, a collection of chant published in 2011. Dr. George Harne, the College’s president explained why this initiative is so important: “The introit, offertory, and communion chants of the Graduale Romanum have largely disappeared from the celebration of Mass. The College of Saint Mary Magdalen has always striven to celebrate its liturgies with great reverence and beauty. Beginning with fall 2011, all Masses at the College are now celebrated ad orientem. Students kneel to receive communion and sing the ancient chants of the Church. 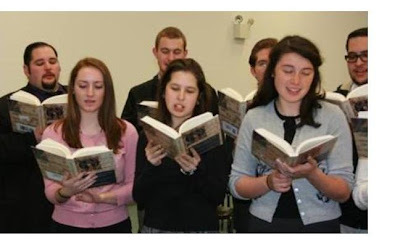 In addition to the Simple English Propers, Latin plainchant, sacred polyphony, and congregational hymns all contribute to the rich liturgical and musical patrimony cultivated in the College and embraced by the students. The spiritual lives of the students at the College are nurtured through a variety of sources: chapels with the reserved Sacrament stand at the center of each residence and give students convenient access to the Lord’s Eucharistic Presence throughout the day and night. Students also have the opportunity to pray the rosary in common daily as well as Lauds and Vespers in the main chapel.